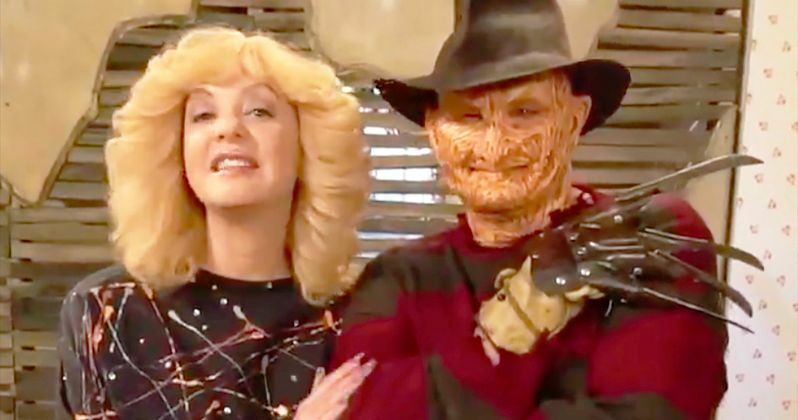 Robert Englund is back as Freddy Krueger in a new video promoting The Goldbergs Halloween episode. It's been 15 years since Robert Englund portrayed the iconic dream demon on the big screen and many fans believed that he'd never get back into the full makeup again for the either the small or big screen. It's not clear how they were able to convince the actor to come on the show, but that doesn't even matter. For now, horror fans are going to be very happy to see Englund back as Freddy Krueger in any capacity. The Goldbergs Halloween episode is a A Nightmare on Elm Street spool titled Nightmare on Elk Avenue. It centers on the fears of Adam, after seeing Freddy Krueger in A Nightmare on Elm Street. Robert Englund says that his appearance on the hit ABC show is "a spooky valentine to the fans." The network released a behind-the-scenes video featuring Englund in full makeup along with Wendi McLendon-Covey's Beverly Goldberg asking if there is a Mrs. Krueger, while Englund stares menacingly into the camera, not breaking character once during the short announcement, which will more than likely want fans to have him back even more. After seeing Robert Englund back in action, many horror fanatics are going to wonder why he doesn't come back for another movie. The actor claims that he's "too old" to play Freddy Krueger now. Englund doesn't think that he could perform all of the fight scenes that would be needed to play the character authentically. Plus, Englund likes that his last performance of Krueger on the big screen ended with a wink to the audience. However, seeing Englund on the set of The Goldbergs proves that he hasn't lost a step and can still scare the hell out of people with a simple stare. At the 2018 Summer Television Critics Association press tour, Robert Englund took part in the Eli Roth's History of Horror panel and was asked what he would do with Freddy Krueger today. He revealed that he had a big enough budget, he'd have a bunch of different actors play Krueger for all of the potential victims, noting that "Freddy is only alive in the imagination of his future victim." It would be awesome to see Englund get back into the franchise in any way possible, even if it's behind the camera. ABC has not announced an official release date for when The Goldbergs Halloween episode will air, but it's safe to assume that it will premiere in October. From the looks of the behind-the-scenes video, Robert Englund will have a pretty large part in the show, which is awesome. Hopefully Englund's appearance on the show motivates him to get back into character more often. We could all use some more Freddy Krueger in our lives right now. While we wait for more news regarding Freddy Krueger small screen appearance, you can watch the awesome video announcement below, thanks to The Goldbergs Twitter account.